That’s the key shade for next season, according to Pantone’s Fashion Color Trend Spring 2018 Report. And with self-expression continuing to dominate fashion, the report is gender neutral and multifaceted to the tune of 12 colors, instead of the typical 10, with many unexpected colors making the list, according to Pantone Color Institute executive director Leatrice Eiseman. The fact that industrial, product and interior designers are embracing unexpected shades also resonates with people. First Lady Melania Trump may have singlehandedly given this hue worldwide coverage thanks to the Ralph Lauren ensemble she wore to her husband’s inauguration in January, but the clear blue sky-inspired tone will be prevalent for spring 2018, too. Recent coverage and documentaries about Princess Diana, who favored blue, has brought the color back to the forefront of the fashion. The “expansive” shade hints at “the promise of a new day” and relays a “lovely, cooling feeling,” Eiseman said. The Mother Goose nursery rhyme name is meant to be a play on its genderless and trans-seasonal qualities. Boys, girls, women, men — Little Boy Blue works for everyone. More commonly known as the crushed red pepper condiment used in Sichuan cuisine, this fiery shade does not exactly scream “vernal equinox.” Even Pantone colorists were surprised that it landed so high on the spring list. This earthy, brown-based red is a great mixing color, transitional and “that touch of seasoning that you sprinkle into a spring wardrobe,” Eiseman said. Named to play into people’s interests in all things culinary, Chili Oil also serves as a transitional color. As a keynote speaker at the biannual International Home + Housewares, Eiseman said “what’s happening in the food and beverage area often tells us where we’re going with color.” Like Cherry Tomato, Chili Oil really “brings that piquant, spicy color with a lot of verve, that’s what we’re seeing in the food industry,” she said. Anna Sui seems to have gotten the message, using both shades for her Anna Sui x Inc. launch invitations. Another fragrantly named color, Blooming Dahlia is of the very light, soft sort and an answer to the orange family. Depleted of the vibrancy of orange in Cherry Tomato, Blooming Dahlia is taken down to a lighter intensity that is very appealing, Eiseman said. Like Blooming Dahlia, this violet rose hue is quieting. Venus Williams warmed up in Wimbledon leggings. And Rodarte’s Kate and Laura Mulleavy had their own interpretations of it on the runway in Paris in July. Monique Lhuillier included a Pink Lavender strapless, feathery gown in her first outing in the French capital. Pantone is banking on this “wonderfully imaginative” purple that underscores originality and ingenuity that melds well with the entire field for spring. This complex shade may leave some wondering, “Is it more blue or more red?” (Blue-based is the answer.) But Ultra Violet is more modern and less prom dress when paired with Chili Oil. Versace and Zuhair Murad worked this petal-like shade into their respective couture collections. As the faintest of this season’s pastels, it sort of riffs on the other two. Gentle, ephemeral and floaty, Almost Mauve is ready-made for fabrics of the same ilk. With nostalgia in vogue, this romantic quiet color is reminiscent of another time and another place — post-War even, Eiseman said. Puma, Mizuno, Salomon and Columbia Sportswear are a few of the athletic brands that have known the might of this neon. Ath-leisure labels followed suit, using bright punches of the color, not simply for fashion reasons, but safety ones. “When Lime Punch first came on the scene it was a hard sell. A lot of people might have worn it for accents, but now the consumer acceptance factor is way higher than it has ever been for this shade,” Eiseman said. Rochambeau designers Laurence Chandler and Joshua Cooper seem to be on to the trend, dousing their Sept. 10 show invitations in Lime Punch. 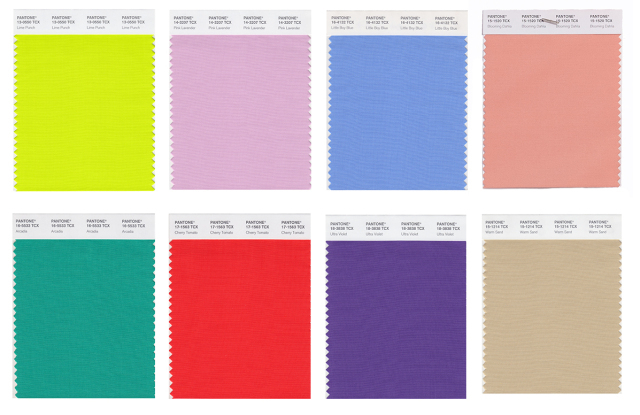 Not wanting to diffuse the aforementioned colors, Pantone created a Spring 2018 Classic Color Palette. While it is not unusual to see navy, gray, sand and white in a spring palette, this grouping presents a separate unit of neutrals that are really core basics, Eiseman said. This navy-rooted hue is very comforting and one that helps to solidify the spring palette, she said. “We’re calling this group of 12 genderless, because we see these colors coming to the fore of women’s and men’s,” Eiseman said. This midtone dove gray is already important in interiors and from a fashion perspective it solidifies wardrobes. If you’re Gigi Hadid, you try it as a summer lipstick. This foggy gray provides an alternative to year-round basic black, Eiseman said. “In spring and summer, black can get a little heavy. There’s not anything you can’t do with a light neutral gray,” she said. Lazy seaside weekends are another year away for most workers, but this tawny colors can be a reminder if nothing else. Like gray, sandy neutrals are something that shoppers have invested in again and again. The do-no-wrong basic can also be used to offset any of the spring palette’s more unexpected shades. Kanye West and The Row’s Ashley and Mary-Kate Olsen are among the designers who have counted on this color again and again. Coconut Milk is kind of a mainstay of white and off-white. Although Eiseman allowed that white’s popularity last year may have been politically charged, going forward it will be more about “that really clean feeling” that also goes along with diaphanous floaty fabrics. “What’s more diaphanous than white?” she said. This entry was posted in London, Milan, New York, Paris, Trend Reports and tagged Pantone, SS18, wwd. Bookmark the permalink.